Penthouse suite on the third level with two bedrooms, two bathrooms, and 1,600 square feet. Open kitchen. Laundry room with full size washing machine and dryer. Master bedroom has a king size sleigh bed, large walk-in closet and tiled bathroom with a shower and skylight. 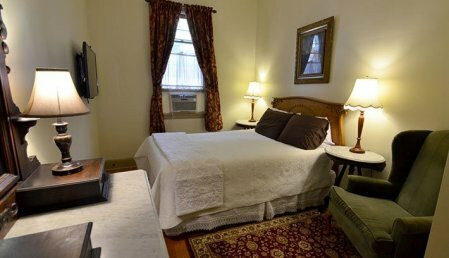 Charming second bedroom has a queen bed and a bathroom across the hallway with a glass shower. First floor suite with two bedrooms and two and a half bathrooms at 1,800 square feet. Open kitchen and living room. 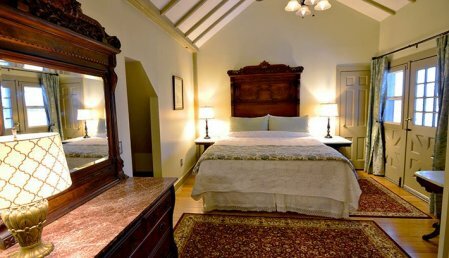 The master bedroom has a King size sleigh bed, with a tiled bathroom that has a Jacuzzi tub and glass shower. Charming second bedroom has a queen size bed. Stackable full-size laundry washer and dryer in the second bathroom. Open kitchen with bar seating. Deck off the living room. Second floor suite with two bedrooms and two bathrooms at 1,800 square feet. The master bedroom has a King size bed, with a master tiled bathroom that has a large soaking tub and tiled shower. Charming second bedroom with a queen size bed. The other bathroom in the hallway has a glass shower. Laundry room with full-size washing machine and dryer. Open kitchen with bar seating. Second floor suite with two bedrooms and one bathroom with 1,200 square feet. Carpeted throughout, eat-in kitchen with tile floor, and comfortable living room. 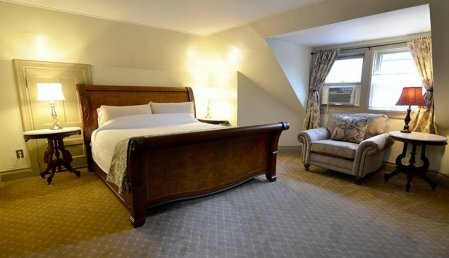 Beautifully furnished with antiques and comfortable furnishings. One bedroom with a king bed and the second with an extra long twin bed. The bathroom is tiled with a glass shower. Spacious and grand living space of 1,900 square feet in what was once the original Carriage house from the 1800’s. First floor Suite with two bedrooms, two bathrooms, open kitchen with bar seating, dining area, and living room. 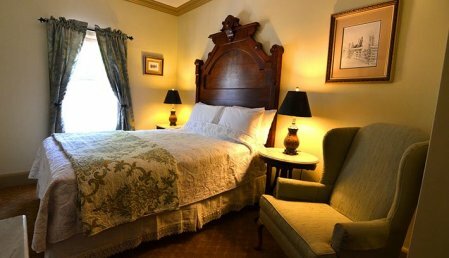 Each bedroom has a King size sleigh bed, antiques, hardwood floors, tall elegant windows, large closet space and cozy sitting areas. Stackable laundry washer and dryer. Second floor suite with two bedrooms and one bathroom at 1,200 square feet. 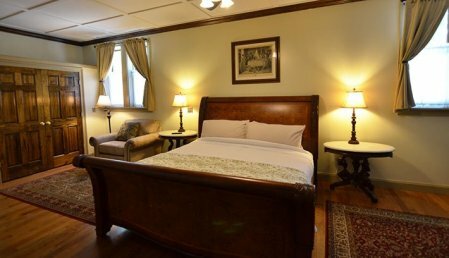 Beautifully furnished and decorated with antiques and comfortable furnishings. Bedrooms have intricately carved antique headboards and marble-top dressers. 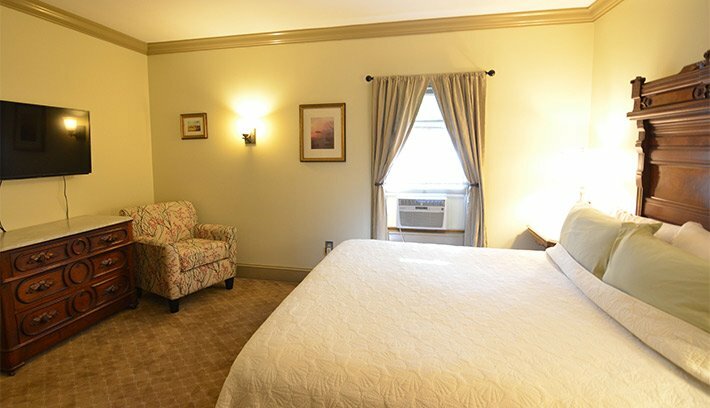 One bedroom with a king bed with a small porch, and the second bedroom has a queen bed. The bathroom is tiled with a glass shower.